The "post-couple" reunited for an open conversation about their romance Wednesday evening in Los Angeles. Jill Soloway and Eileen Myles are a power couple — Soloway, the queer creator of Transparent, and Myles, the lesbian punk poet. At least that is the narrative that has been following the two, but Soloway and Myles came together Wednesday to dispel the false rumor that they are a couple. 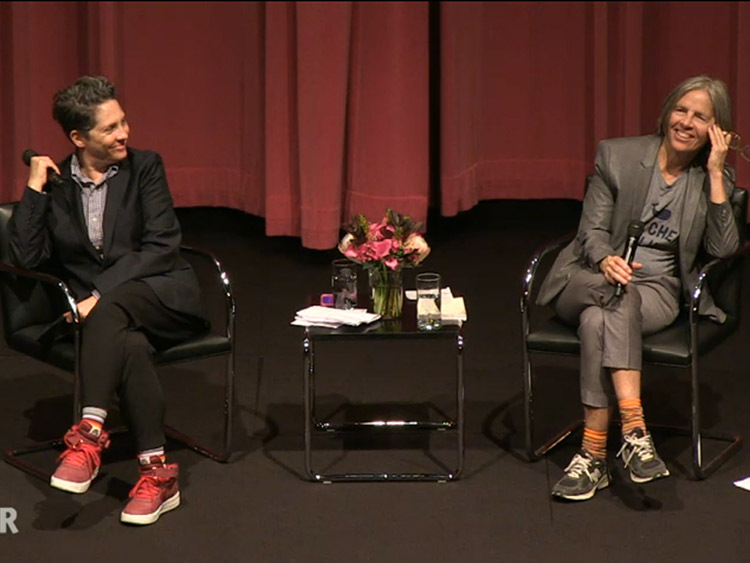 The pair conversed onstage at the Hammer Museum in Los Angeles. The Hammer publicized the talk as an event where "Myles and Soloway discuss ways of representing queerness in literature and the mass media." But the two had other plans. "We have things in our relationship that we haven't quite worked out yet, and we thought we would just process our relationship onstage," Soloway said at the start of the event. This wasn't a joke, though people in the audience laughed. Soloway said they wanted to engage in a form of "public intimacy" with the audience. Speaking about their love affair in a public forum was perfect for them, as both admitted the stage is the place where they both feel most comfortable, and they reminded the audience that it was on a panel that their love affair began. "The first thing is this, guys. We're not actually dating anymore," Soloway announced, pointing out despite what articles on them may say, they are no longer a couple. Both said, however, that they continue to love each other. They described their current relationship as "open," "poly," and then later called themselves "divorced lesbians." They had no qualms about going into the messy details of their relationship, revealing that the pressures of being in a public romance took its toll on the couple, who did at one point enjoy being a power couple. The stress of working on Transparent, of traveling, and of living and working on different coasts proved to be too much for them. The duo also read from the radical feminist Paris Thanksgiving Manifesto they wrote together. Both Myles and Soloway told the audience at the Hammer they didn't want to do anything traditional. They asked audience members to interject whenever they felt "uncomfortable" or "triggered." They stuck to their rules and allowed attendees to ask very personal questions, such as to reveal why they broke up, how they inspire each other, and how they met. Read more about the intricacies of their relationship below. Myles and Soloway revealed that they met while on a panel at the Contemporary Jewish Museum in San Francisco. Soloway told the Hammer audience that someone recently told them they listened to that talk from the Jewish Musuem and "they could hear the sound of us falling in love in it." "Like the sound of fairy dust falling," said Myles. "We did fall in love on that stage," added Soloway. Before that encounter, Myles had come up during a meeting in the Transparent writers' room, Soloway said. The writers were in the process of creating Leslie, a character played by the out actress Cherry Jones, who is based on Myles. Soloway wasn't aware of Myles at that time, but upon recalling that the panel with Myles was coming up in a couple of months, began researching the poet. So while the Transparent crew was developing the Leslie character, Soloway was concocting a plan involving Myles. "I went to the San Francisco musuem planning to seduce you," Soloway told Myles onstage at the Hammer. Soloway said Myles was "the last stop on the femme train for me." Being butch, Soloway said, is a "respite" from a part of their personality they don't want anymore. (Both Soloway and Myles use gender-neutral pronouns.) "I can't imagine dressing femme right now because I feel it would be a strange costume," said Soloway. Soloway also said that people should be able to switch from being butch to femme at any moment, and not feel restricted by it. They said they do it internally. Soloway said they feel more "free to be a thinker" when they dress butch. Soloway also said being butch made them into a better father. "The point at which the couple becomes public ... is usually for me, when the flower starts to fade," said Myles. "Suddenly everyone is really invested in the two of you together." "We had an awareness as we could see our relationship getting to a place of coming out it was also coming to an end," Soloway admitted. "I was really nervous about coming out and being out. I really wanted to come out in the New Yorker font. I felt like that would protect me somehow. And to not be like 'I'm gay!' but instead, 'Jill Soloway and Eileen Myles' in the New Yorker font." Soloway was referencing her coming out via a New Yorker profile. "By the time the article came out, it was a week or so before we knew we weren't together anymore," Soloway added. "That's part of what we went into it for," said Myles, when they were asked about this subject. "I met you onstage like this and I thought you were cute but I loved your mind. I thought you were so smart," said Myles, while looking at Soloway. Myles said they felt like they were seeing "this whole other world, this other reality," through Soloway. Soloway said they became an "iteration of myself in Eileen's reflection." Soloway was aware a desire to become more like Myles. "I've absolutely, a hundred percent, positively, your influence on my work, my writing, my voice, my confidence, in my book I have multiple chapters where I cop to stealing Eileen's writing style," said Soloway. Soloway is currently working on an essay collection based on her life. "There was something really profound about being in a hotel room in Paris and feeling full of all these things about feminism, about women and men, about the state of things, and wanting to make a manifesto," said Myles. "Writing this thing together was such an act of passion." "It was beautiful. Really passionate, really beautiful. I think that was one of the things that I fell in love with you the most, that we both wanted to live in this imaginary world where we were changing the world together, and it was right after the attacks in Paris, and we felt like we're going to write a manifesto together and we're going to pretend that we're part of history and we're changing the world," said Soloway. "This belief, this bubble that we lived in together, writing this together — that was easy for me, that kind of love, and loving you was easy," Soloway added. "When you do make something you feel passionate about, you do change history and the world is changing," said Myles. They both said they don't want to be confined by the gender binaries of male and female. Myles said they felt like them/they felt more comfortable instead of having to constantly switch from he/she. "It was over the course of ... there were a few breakups," said Soloway. Soloway said they read one of Myles's poems that was about a relationship's downfall and asked Myles, "Is this about us?" It began around that time, they agreed. The duo agreed that the complexity of being in a long-distance relationship made them both feel that they had to "put a show on" when they did get to see each other. Soloway said it was "different cities and different lives" and said they would take "some of the blame." Soloway said they remembered falling in love with Myles and walking across Los Angeles. Soloway said they felt "so excited and alive" and they were texting Myles all day and sending photos. "That was a beautiful day," Soloway said. "We did so many beautiful amazing things together." Soloway acknowledged feeling too unstable to be in a relationship, having just come out of a marriage, being at work on Transparent, and having too many things taking up their time. Though the two are not in a relationship anymore, they still talk often on the phone and hang out. Myles feels closer to Soloway than to anyone else. They both said they love each other. Watch their beautiful, open conversation about their relationship at the Hammer below.